Do Mylar bags have a place in your preparedness efforts? Absolutely. While I store a lot of food and non-food items in four gallon square buckets, #10 cans, Mason jars, and five gallon round buckets, there’s still plenty of tinsel in my pantry in the form of Mylar bags. Why? Mylar bags make your food access more convenient. Mylar Bags are easy to use-and lighter than a bucket! Rather than bug my hubby to carry up a large bucket of white rice, I can simply get a Mylar bag of rice, heft it upstairs myself, and store it in my kitchen cupboards as I make my way through its contents. As great as plastic buckets are, they’re not oxygen proof, whereas quality Mylar bags indeed are. They also shield the contents from light, and so long as they are a good thickness, cats and rodents will not chew through them. Mylar bags are reusable and the gusset bottom ones make them easy to fill as well. I recommend getting a zip-locked version so that your food can continue to stay preserved while you are working your way through the contents. Mylar bags are also water and moisture resistant and are more durable in the event of a flood or earthquake. When sealing a Mylar bag, you don’t need one of those fancy Mylar bag sealers. You can seal a Mylar bag with your Foodsaver, a curling iron, or a hot iron, even if you’re investing in the really large bags. When using an iron, simply set it on its highest setting, set the bag on a metal surface or a metal leveler, and slowly run the hot iron over the edge to create the seal. Use the curling iron on its highest setting and move it slowly across the top of the bag as well. If you purchase quality, thick, Mylar bags, they are great to reuse, so pay a little extra for the more durable kind. When you open a Mylar bag, if you do it gently or with scissors you can easily reuse it. Your bag will get “smaller” after each use as you cut it open, but trim sensibly and they will last a while. As mentioned earlier, I also invest in zip-lock topped bags. Sometimes I will reuse a bag so many times that I have to cut below the zip-locked edge to open it, but at least I can still seal it with my Foodsaver or a hot clothes iron. That way I can continue to seal the bag in between uses. Personally, I think Mylar bags inside a plastic bucket are overkill. Perhaps I’d even go so far as to say that fear mongers or cheap manufacturers came up with such an idea. If you’ve got a good quality Mylar bag, you don’t need to pair it with a bucket—unless you’re simply trying to make the handling and tight fitting storage of all of the Mylar bags more efficient. On a final note, understand that I use a variety of storage methods for my goods. I have some in jars, some in buckets, some in Foodsaver bags, some #10 cans, and some in Mylar bags. This way I’m protected against a broad range of possible events and natural disasters. An earthquake could break my bottles, a flood could seep through my bucket lids, or a fire could burn through my bags. While I have yet to find one storage method that does it all, a Mylar bag is great to use in concert with other methods. It’s easy to heft, minimizes moisture, truly protects against oxygen, bug infiltration, and light exposure. When I use Mylar bags with a Foodsaver when storing dry goods such as candy, brown sugar, rice, flour, cereals, chocolate chips, cake mixes, or muffin mixes, I get them to last a lot longer than the typical expiration dates. The Foodsaver will get rid of all of the oxygen inside, and your items will stay snug and tasty until you get into them. So long as you have electricity, you can keep sealing them up each time you remove something from them. Worst case scenario, if you find you are without electricity, you can still seal the bag with a hot antique iron (that you warm over the fire) leaving just a small smidgen of room in the seal big enough to fit the tip of a tire pump. Insert a tire pump that you’ve reversed the direction of the air flow on, and then just pump away to remove the oxygen, grasp the corner, remove the pump tip, and then quickly seal the last gap. When purchasing Mylar bags, be sure to inquire about the thickness as well as the other dimensions of the bag, whether or not they are gusset-bottomed (for ease of filling, using, and for better shelving), and a zip-locked top. If a bag has “large dimensions” but does not have a gusset bottom then your usable space is downsized a bit. Mylar bags are great, though I have had rats get into even the thick bags before. I usually put them in a box or bin not only to help organize, but it keeps that odd chance that something pokey will puncture the bag without my knowing. Basically, if you create 1 or 2 week sized bags of your commonly used items, and put those into boxes/buckets together it works best. You avoid any spoilage from opening something too large, and always have a nice rotation. Plus it makes quantifying your storage much easier when each box == 1 week of family meals, with known recipes for each. Thanks, Kellene, for your mylar idea. Might you share with us a favorite supplier or two? FiveStarPreparedness.com offers these...they are 4.5 mils, hold about 4 gallons, and have a zip lock top and a gusset bottom. You've got to know that my hubby would only carry the best kind if his business was going to carry them. I'm sorry, but since they are so handy right here, I don't have any other sources that I recommend. I kept getting disappointed with the thickness and other features when I bought elsewhere. If anyone else knows a source, by all means share. They are $1.40 each with Five Star which I believe is a good price. Again, if anyone else has feedback, let me know. Kellene, is your husband still offering these mylar bags for sale? I just had a look and couldn't find them on the website. Thanks much. Sorry Michelle Five Star Prepaedness is no longer offering mylar bags. Thanks for inquiring though. 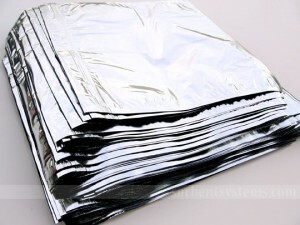 USA Emergency supply carries a good variety of 5 mil mylar bags. The 11x16 w/ ziplock are $1.27. I use them for everything and they fit in my food saver. If you can share your favorite mylar source, it might help orient us newbies toward the best products. I've added you to my RSS feed, Kellene, and am enjoying your preparedness posts. The Church's website (ldscatalog.com) sells a box of 250 for $94. Can those really be sealed with a Food Saver??? yes, those definitely can be sealed with a Foodsaver. Unfortunately, while I found that to be a great price, they weren't as thick as I wanted them, with a gusset bottom, nor wiht the zip lock. Bummer. My foodsaver will seal the mylar bags from the cannery, but the vacuum feature doesn't work with it and they are too wide for my sealer. (But, I cut the bags smaller, 1/2 or 1/4ths for some things and use the oxygen absorber packets. I've had neighbors with rodents gnawing thru mylar, too, so I put them in 5-gallon buckets. A long narrow half-bag is a nice size for smaller families and you can fit 8-9 of those in a bucket. They actually fit better than the full size bags. Kellene, do you have a heavier duty foodsaver that is wider and will vacuum seal those heavy bags? I don't profess to be 100% accurate, but when I've done the in-home evaluations, the only Mylar bags I've seen getting eaten through are the thinner ones. So keep that in mind. I don't have to be right in this regard, I just don't want anyone to spend money they don't need to. Sorry, there isn't a wider Foodsaver machine. When it's wider than the Foodsaver, I use a hot iron, and then use that handheld vaccume sealer for the last little inch before sealing it completely. I also have the commercial grade bag sealer, but to be honest, I rarely have used it. Hopefully in Dec or Jan. Getting buckets, bags and Propane tanks. I guess nothing is ever perfect so make the best of what you have. I've had good luck with food grade freezer bags stored in Tupperware totes. It took a couple of months to get it all working.. Once we get pass the puppy emergency. I will get at least 20 buckets and bags and I hope a propane tank. Nothing is ever perfect. Adapt and overcome, or piss and moan in a corner. Let's see what shall I do? I will order and try stuff and there maybe a fix. If you have rodents get a cat, they work very well and are green. Why do you want Kellene to solve all your problems with life? Dang you are adults, if you don't know something google it. When the SHTF she will not be there. Internet will go down. C'mon folks it's learn and be self-sufficient. Grow up, Kellene will help and the rest of will give you ideas. Damn do we have to hold your hand and stroke you so you don't feel bad? I have a question. I just purchased over 500 lb. of grain and beans and I wanted to pack it myself. I have mylar bags and oxygen absorbers. Last night I packed about 20 bags. I put in the 500 cc oxygen absorbers which were about a month old and kept stored in a mason jar and covered with rice to the brim. This morning I looked at the bags and they don't look like the oxygen is gone (not "sucked in"). I sealed the bags with my FoodSaver, but sometimes the seal didn't work and I had to do it multiple times. Some of the bags were ZipLok bags. None of these look like they would if I vacuum sealed them. Should I order new oxygen absorbers and start over? This is too much product to take a chance on. Thanks so much for any answers!! Debbie, that's the snag with purchasing oxygen absorbers. You have to be able to trust your source. You can't store them in ziplock bags because they allow oxygen to permeate. So using an oxygen absorber in one is not a good idea. Oxygen absorbers should indeed show that they've been in the bag. If you use the foodsaver, you should also be able to clearly see that the bag has been exhausted of oxygen. So to answer your question, yes, start over. Good luck! I like to use the thinner mylar bags and oxygen absorbers to make 5 pound pouches that I then store in round 5 gallon buckets. I like the buckets because they offer so much protection and because I can stack them efficiently. With the small pouches though, I can break into a pail without compromising the freshness of the entire contents. I have always bought the thin cheap bags, but I'll definitely look for some with the ziplock and gusseted bottoms. Thanks for all of your work on the blog, it is appreciated! I'm glad Kellene put up with me. It's not easy just ask my family. She gives me an outlet to try and help. Saves me from headaches and annoyed walls. There is always a way of getting around limitations. Get creative, try new stuff while limiting your loss if it's wrong. I don't care for the "Ziplock" bags. Yes, they are convenient, but do they work? Remember you are betting your family's survival on these things. Now I started out with basic bags and Rubbermaid containers. I've gone to restaurant grade freezer bags and Rubbermaid containers. Now I've had no problems so far, but I want to make myself as disaster proof as possible. Plus I got a cat. Next I will be moving to Mylar bags and buckets. #1 reason is a filled 18 gallon tote is very heavy. They do work at blocking sunlight, I have a cool basement to store food. They are multi-tasker which I love. I love the idea of grabbing a small bucket and have prepped items I can just put in a pantry and have meals for a week. I want my food investment to be easy to use and easy to transport if needed. I ended up getting a few mylar bags from a church cannery, and tried to seal it with my brand new food saver - with zero success. Are they too think? The bag got a little warm, but no seal whatsoever. And I have tried sealing them with an iron, but it is taking way too long. Help! Use the iron, hottest setting moving the iron along it slowly with the mylar bag up against a strip of metal. Do that to both sides. I know that works because I have regularly done it from the ones at the cannery. Kellene, will this harm the iron in any way, or should I used a dedicated iron for this purpose? I appreciate this article. I'm researching ways to store rolled oats. I think I'll go with the mylar bags. I've seen reference to short-term & long-term storage. I imagine the length of time is different depending upon the item being stored. Any idea what they would be for rolled oats? We'll be eating them and rotating them, so some won't be stored for very long. Thanks for all you do. Michelle oats have a 30 year shelf life if stored properly. Are you using a hair iron? I had one that never did seal my bags I guess it just wasn't getting hot enough. I found one that said "high heat" in walmart for about $20.00 and it worked perfect and fast. Jamie I have a cat too, boy they can make short work of a mylar bag! Just on jump and its full of holes! 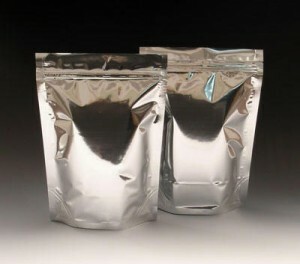 I get big mylar bags cheap from http://www.frontiersurvival.net They are all 4.3 mil and thicker. I often fill the smaller mylar bags and fill a bucket with them for easy use. Unfortunately, the approach is correct, but the industry as a whole has not yet crossed over to calling the bags "foil" instead of mylar. You are right though, mylar, in it's truest sense of the word, is not the best for storing food with, but the thick "foil" bags that I get that are indeed safe are still referred to as mylar. Love love my mylar bags. I have a question now that I read this post. I've tried to use my foodsaver with the bags that come from LDS dist. It doesn't seem to work. What am I doing wrong? THese bags have two bags really, the inside thin part, is that the problem, or me? Most likely me:) Never thought of an iron or curling iron, how awesome! I'd try the hot iron method then, Sherise. why do some of my mylar bags draw up very tightly and others don't do anything? We mylared some meeds yesterday and nothing happened. Also, does flour not get tight in the bag? "Mylar" is actually a dirty word in the food industry because they have grown weary of the wide variety in quality, etc. As such, you may simply be dealing with poor quality. I have seen a video where lds was talking about #10can storage and said they don't use oxygen absorbers when packing sugar. why? Because sugar doesn't go bad. It has an infinite shelf life. Can chocolate be stored in Mylar? I recently got a ton of chocolate and don't know what to do with it. I've given all of my friends and neighbors some but I still have alot left especially MM's. Since MM's don't melt in your hand maybe they could be stored in Mylars. Any suggestions? Joan, I store my chocolate in glass jars using the jar sealer attachment with my FoodSaver. Mylar should work well too. It's easy to SEE the chocolate in the jars, so it seems to get eaten much faster. Kellene, I have worked in the Dry pack room at the cannery for over 20 years... The Church does NOT recommend using anything other than the pouch sealers for use with the 7 ml pouches... The 7 ml pouches are the ones that the church has tested and deemed best of long term food storage..
For those of you who don't know, "the church" is referring to the Church of Jesus Christ of Latter-Day Saints. Forgive our occasionaly alienating banter. We forget sometimes that we're not in our own world and tend to communicate in unfamiliarities. However, you should know that the LDS church is actually a reliable source of authority when it comes to the proper storing of food. If they only give the thumbs up to the 7 ml pouch sealer, then you can bet there's a reason for it. They have to keep their bases covered. So I'd be inclined to follow their lead for the best solution, but try some of my other suggestions if that's not realistic for you. It was instant milk w/25-year shelf life from a large supplier--Costco carries their products--so I'm going to let it go. Thank you so much, though, for the helpful answer that I couldn't find elsewhere. Sometimes, there is just so much information you can't find the answer to a specific question, which is why I'm hoping you can help me, please. I just started with prepping a few months ago and have bought some buckets of freeze-dried food from various manufacturers. Sometimes, the mylar bags inside are like bricks, making me feel confident there's no air left in them, and some bags in the same bucket from the same manufacturer permit the ingredients to readily be shifted from end to end, which makes me think there's a heck of a lot of air left in there. Since I don't have enough inventory to rotate this food on a regular basis, and probably won't be in a position to do that for a year or two, I'm wondering if I should be opening the "loose" bags, putting in more oxygen absorbers and resealing them. Or do you know if it doesn't matter if a bag has shifting room in it? I very much appreciate your website and your time. Unless it's something that doesn't have a 15 to 30 year shelf-life, I simply don't believe in not rotating anything and as such I don't purchase anything that can't be rotated (or that I would really enjoy otherwise.) Anyway, that being said, the items which are more like "bricks" are most likely the items which contain ingredients that are totally intolerable to any air, whereas the items which have some room in them are not so touchy. I wouldn't worry about them if they are from a reputable manufacturer. Do you find that Mylar bags have to shrink up around the contents to effectively sealed for long term storage? Some of our have shrunk up and some have not. 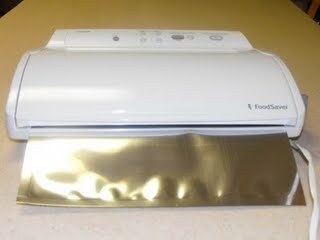 And, when you seal using the Foodsaver or Seal-a-Meal vacuum sealer, what thickness of mylar bag do you use? It's not necessary to crush items in the bag in order to protect them properly. FoodSaver now has a setting on their now models to be more gentle on one setting and more aggressive on another. You need to use heat to seal a mylar bag such as a curling iron, clothes iron, or a commercial sealer. We use a commercial sealer for our mylar bags. The thicker the better in my rule when using mylar. what vacuum sealer are you using for the mylar bags? everything ive read says that vacuum packers wont work with mylar unless you do some fancy work arounds with a combination of regular bag and the mylar. I use a heat sealer that I was able to purchase WITH my mylar bags. I purchased it through the LDS Church's Distribution center. Anyone can purchase from them; you don't have to be a member of the church. And yes, I reuse the mylar bags after emptying them.